The cosmic microwave background is everywhere. Literally, everywhere. A constant low frequency electromagnetic hum which fills the entire Universe. If you switch on your TV when it has no aerial connected, or turn on a radio which isn’t tuned in, a small fraction of the noise you see or hear comes from the cosmos. No, seriously. 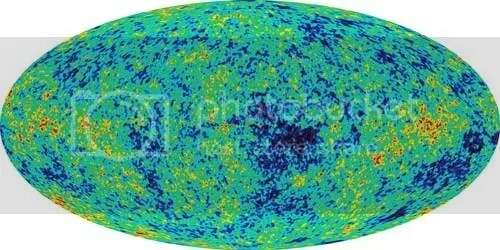 Cosmic microwave background, or CMB for short (ahhh, abbreviations), is essentially the last remaining echo of the big bang. And you can listen to it. At the point of the big bang, the Universe filled a space smaller than an atom, and it was insanely hot. Trillions upon trillions of degrees. As the Universe expanded, it cooled rapidly (courtesy of thermodynamics) although for some time it was still filled with a glowing fog of hot plasma. Totally opaque to photons. After cooling for hundreds of thousands of years, finally the Universe became cool enough for that hot plasma to form into atoms. Suddenly, everything became transparent. Almost every photon around back then has been travelling ever since. Expanding slowly along with the rest of the Universe. After over 13 billion years, those photons are so stretched that they’re now at microwave wavelengths. Over the entire course of it’s lifespan, the Universe itself has cooled from an unimaginably high temperature to just 2.7 Kelvins. All of this was mapped by WMAP, the Wilkinson Microwave Anisotropy Probe. Since its launch 8 years ago, it’s given us a wealth of data on the relic radiation of the big bang. 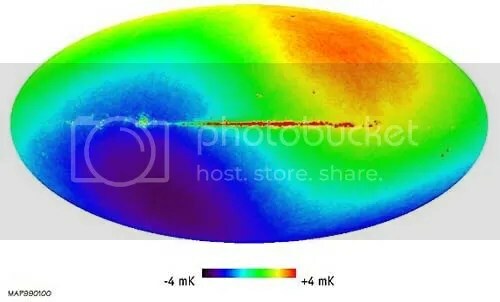 WMAP recorded the pretty oval image shown above — actually an all-sky map of the CMB, showing all of its subtle fluctuations in temperature (red is warmer, blue is cooler). The actual fluctuations are incredibly slight. They’re emphasised in the image so you can discern more easily. But there’s one particularly interesting thing about the WMAP data, and it has to do with us. Ever since good old Copernicus, we’ve known that we’re not the centre of the Universe. WMAP had to be calibrated to correct for this fact. Uncalibrated, there’s an obvious dipole in the CMB as shown in this image. It appears slightly warmer on one side and slightly cooler on the other. This is caused by a doppler shift due to our own motion through the Universe. Now, just pause there for a moment. Consider the implications of what this actually means. Using the CMB measurements, together with a little General Relativity wizardry, you can calculate the inertial rest frame of the Universe! Let’s be honest here. That’s pretty damn cool. As a result, we know that our local group of galaxies is travelling through the Universe at a speed of 627 kilometres per second. Correcting for the Milky Way’s motion within the group, our galaxy travels around 47.7 million kilometres through the Universe every day. Just remember that if anyone ever tells you that you’re going nowhere! As a disclaimer, I’m sure there will be a number of cosmologists eager to pick out the flaws in this post, and probably at least a couple who disagree with everything I’ve just said. Think I’m wrong about anything? That’s what the comment button’s for! This entry was posted in Imported from Livejournal and tagged cosmology. Bookmark the permalink. Could you write an article about how we know that we’re moving?